Why would a person be interested in reading a book published forty years ago? It doesn’t seem that is old enough to be considered a “classic,” and, to a degree, the author is not one of current list of “hot” authors that everyone wants to pick up. Still, there are often reasons to read a book not on a current best seller list that have less to do with the author, the subject, the title, the whatever. In this case it was a “waste not, want not” situation. I’d purchased this book over two years ago on a trip out of the country (It cost 187 “I-don’t-know-whats,”), I’d had it sitting around and had recently run across it again while winnowing my book collection to decide what to give to Lincoln City Libraries as donations. A little history here — I’ve always been interested in trains. Our first home (my twin sister’s and mine) was an apartment a couple of stories above the local public library in Emmaus, Pennsylvania, with the back “yard” a steep bank falling away to railroad tracks on which heavy rail cars clanked their way by. Our second home was an old place (Built in 1879 by A. & H. Hoerhammer) on Railroad Street, with those same railroad tracks now a narrow street and a less-steep bank away from our front door. So, you see, I couldn’t help but be, if not interested, at least steeped in the noise, smells, etc. first of steam locomotives, then diesel monsters as their rushed or crawled by our house. But back to the book. 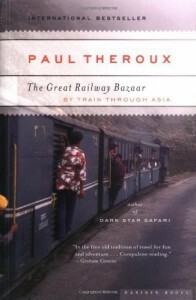 The Great Railway Bazaar recounts author Theroux’s four-month journey, mostly by rail (with a few legs of the journey by ship and plane) all the way from Great Britain, to Japan and back. Most critics consider this book Theroux’s greatest achievement, but he has also written fiction — Jungle Lovers, Saint Jack, and perhaps more famous, The Mosquito Coast, several of these having been made into films. If you choose to read this book, you will find the author highly entertaining (of the “laugh-out-loud” variety) at times. Other times he comes across as too critical of an entire culture (a little too much generalization at times), and at other points in the book very incisive. He doesn’t shrink from controversy and tackles just about anything, not excluding himself from criticism when he feels it is needed. One of the most entertaining aspects of this book for me was that it dragged me decades back to my time as a not-very-good English major in college. The book is loaded with literary and historical allusions, making me want to go back to books I missed (or didn’t finish reading) all those years ago, and savor them with the passage of time and their relationship to this book. The author also captures the essence of really long-distance travel, especially to foreign countries when he says, “. . . the scenes changing in the train window from Victoria Station to Tokyo Central are nothing compared to the change in himself; and travel writing, which cannot but be droll at the outset, moves from journalism to fiction, arriving . . . at . . . autobiography.” And in this he is in good company with both Mark Twain and Henry James.